Anacapri is a comune on the island of Capri, in the province of Naples, Italy. 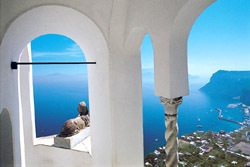 The Ancient Greek prefix ana means "up" or "above", signifying that Anacapri is located at a higher elevation on the island than Capri (about 150 m higher on average). Administratively, it has a separate status from the city of Capri. The most important sight in the village is the Villa San Michele. French composer Claude Debussy was a regular visitor to Anacapri. He even named one of his preludes from the first book, No.5 "Les collines d'Anacapri" (The hills of Anacapri), in homage to the community. One of the tourist attractions in Anacapri is the chairlift (seggiovia) to 589-m Monte Solaro for picturesque views of the south-facing coast.